The origin of the term, “fortean” is traced to Charles Fort, who rose to prominence because of his investigations of anomalous phenomena. Buy a single copy or subscription to Fortean Times magazine. 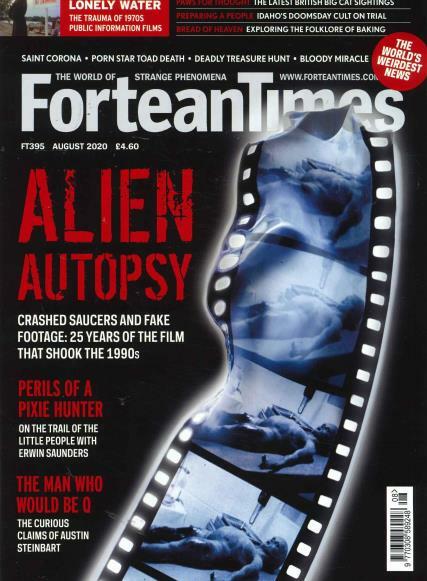 Fortean Times is a monthly news magazine that specializes in bringing to light, the world of strange phenomena, comprising of well researched articles on strange and curious experiences, quite often failing to scientific review and scrutiny. Under the popular column with the caption “Strange Days”, it collates a wide variety of fortean events encompassing strange deaths, ghost watch, UFO Files, Myth Busters, Conspiracy Corner, Science, Archaeology, Medical Miscellany, Obituaries and Cryptozoology etc with sub captions of the same titles, providing a comprehensive and balanced coverage of the “world of the weird”. Its core philosophy is to dispassionately explore the unexplored frontiers between the known and the unknown, away from the routine ‘Breaking News” to report the major fortean events around the world. It professes to provide a common unbiased platform, for presentation and brainstorming of ideas and observations, however odd and redundant, intriguing or unpopular, weird and inexplicable, swinging between the extreme limits of orthodoxy and unorthodoxy. Inviting articles from its readers under the “Community” caption, it endeavors to build in the elements of belief and trust by featuring video clips, photos, web links with true to life stories, titled “It happened to me”.